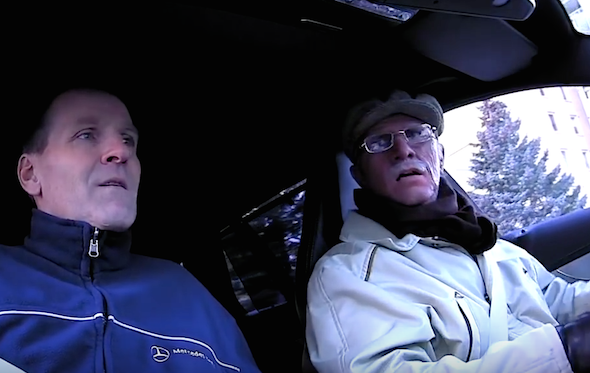 Rally ace Petter Solberg donned an impressive disguise in order to look like an 82 year-old man, while pretending to be a stranded Mercedes owner. Sitting at the side of the road, Solberg calls Mercedes technicians for help, with the unknowing mechanics appearing at the window before long. While complaining about 'a noise at the back', Solberg takes the technicians for the ride of their lives, sliding and drifting the AMG C63 across an empty car park. The shocked passengers seem unable to comprehend how an elderly driver could be performing such amazing driving stunts - with one of the technicians asking Solberg to stop while jumping out of the vehicle. Before long Solberg reveals his true identity, with all of the specialists appearing shocked that they had been sat so close to a rally legend.